This is a really useful Lightroom tip. Fuzzies are dark blurry looking spots that usually show in the skies of photographs. They are caused by dust resting on the camera sensor. No matter how conscientious you are about cleaning your sensor and avoiding dust, it’s going to get on to the sensor no matter what. It’s insidious and evil! 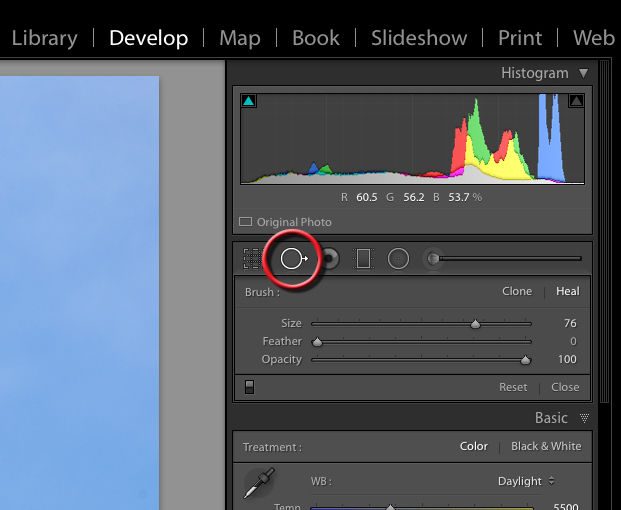 Fortunately, there is a way to see even invisible dust in Lightroom 5. This feature is part of the Advanced Healing Brush in Lightroom 5 (A.K.A. The Spot Removal Tool) that I wrote about in a previous Photofocus post. Open the Spot Removal Tool in Lightroom 5 by pressing the Q key or clicking its icon–the second one from the lift under the Histogram in the right sidebar.